Need some expert advice? Whatever the nature of your query, however large or small your problem or project, call Panks and we will do our best to help you find the solution. Do not hesitate, please just pick up the phone, email us or drop into one of our branches. Whether your enquiry relates to business or industry, or to your own home or garden, we are on hand to discuss your issues and offer professional support on a wide range of issues. Pumps and pump technology, boreholes and wells, cess pits and sinks, solar energy and sprinkler systems, electrical wiring and energy efficiency gains, private water supply or pressure boosting, water treatment plants – or irrigation for your plants…..here at Panks, we have the knowledge and expertise – and we are happy to help. Just get in touch with a member of our friendly team and let us establish how we can best assist you. For advice on a whole range of technical hitches and mechanical glitches – from specific process pumps in food pack-houses or trouble with industrial heating systems or farm machinery – right through to the kitchen sink – just call Panks. It might be that through a telephone diagnostics we can help you resolve your problem immediately, offering a quick fix you can apply yourself. Or possibly we will diagnose the likely cause of the problem and offer advice for the next steps required to put it right. If needed, we will arrange for one of our Gas Safe or NICEIC accredited engineers to come out to you. All our vans are fully equipped and carry a range of spare parts, enabling many jobs to be completed there and then. Whether to repair or replace? Call us and we’ll put you in touch with the Workshop Manager who can offer you honest advice, always with cost-effectiveness for you as the main goal. If required, he can assess the problem component and produce a full report and recommendation. Perhaps you know what you are looking for but you are not sure where to find it – let us help. We can source direct replacements direct from the original manufacturers or, if parts are no longer available, we can recommend the best alternatives. And for those extra special cases, it might even be that our machinists can make just what you need in our machine shop. 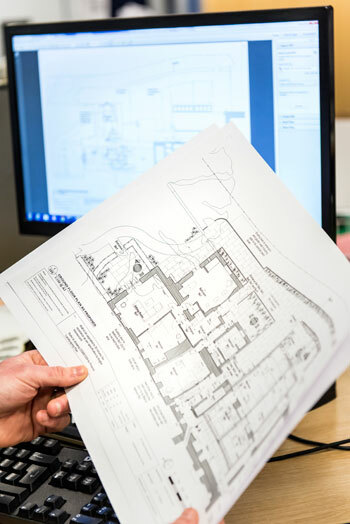 If you need detailed advice with regards to specific project planning we will work with you to survey and evaluate your plans and/or existing systems – then we’ll help you design the best solutions to meet your requirements. 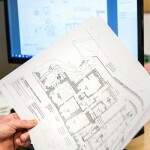 We will also work with pre-determined specifications provided by outside consultants. Most importantly, we listen and are flexible to your needs and we want to help you find the optimum solution. If you want to discover how your home or industry can improve its carbon footprint and make efficiency gains we can make recommendations or put you in touch with our dedicated Energy Engineer. He can visit your site to discuss your needs, assess the performance of your current systems and evaluate your energy consumption – and thereafter make recommendations for efficiency gains. As a full Anglian Water MEICA partner, (Mechanical, Electrical, Instrumentation, Controls and Automation) in industrial equipment systems, we know how to reduce your carbon footprint and meet health and safety requirements in line with the Environmental Agency guidelines. Our aim is to solve and resolve – whatever the nature of your problem, however immediate or long-term, however large or small. And we will go out of our way to help you. For expert and friendly advice you know you can trust, just call Panks, drop us an email or visit us in one of our three branches in Norwich, Ipswich and Peterborough. We look forward to talking to you! 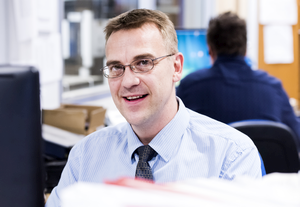 Steve Mason - Sales Manager If you have a query on water supply, pressure boosting, wastewater & sewage or even just a general pump enquiry - just drop me an email. Either myself or a member of my sales team will gladly help to find what you're looking for.